The address of representatives of Human Rights Center Viasna with the demand to stop the unlawful persecution of the Belarusian-speaking soldiers including F.Viachorka has been forwarded again – this time to Homel inter-garrison military procuracy. The human rights defenders were officially informed about it by lieutenant-colonel A.Kot, first deputy military prosecutor of Belarus. Bear in mind that on 27 July the human rights defenders Ales Bialiatski, Valiantsin Stefanovich and Uladzimir Labkovich addressed the defense minister of the Republic of Belarus Leanid Maltsau and the prosecutor general Ryhor Vasilevich with the demand to put an end to the unlawful persecution and pressurization of F.Viachorka who was serving in military unit 48694 in Mazyr, as well as other soldiers who were speaking the Belarusian language. The activist can face a criminal case for membership in an unauthorized organization. Recently he has been served a warning for it. As RFE/RL reports, he was also summoned to the prosecutor’s office for giving evidence. Belarusian democrats meet in Warsaw with representatives of the OSCE Office for Democratic Institutions and Human Rights. They discussed changing the electoral legislation in Belarus. Ales Bialiatski, head of Nasha Viasna human rights center commented on ban to enter Belarus to President of the International Federation of Human Rights (FIDH) Souhayr Belhassen. At the end of last week, the Belarusian secret services detained a Danish human rights activist in Minsk-2 airport and then banned him entry in Belarus. The command of the military unit in Mozyr gave a disciplinary punishment to regular soldier Franak Vyachorka on July 23. The leader of the United Civil Party has sent a letter to the Interior Minister Anatol Kulyashou. Public Prosecutor’s Office for Miensk region issued official warnings to two citizens of Belarus and BAJ members Aksana and Aliaksandar Kalinkin for implementing “illegal journalist activity” on July 14, 2009. The media workers were accused of cooperation with a Russian “TV Channel of Good News” (“Telekanal blagikh novostei”) without credentials “in Miensk and Miensk region since 2007”. In its recent resolution on the situation in Belarus, PACE called upon the Belarusian authorities to allow registration to the Nasha Viasna human rights organization, which is one of the essential conditions for the country to meet the Council of Europe standards. According to Ales Bialiatski, the requirement is an additional stimulus for Viana’s members to continue their activities. ‘PACE’s concern over the situation regarding freedom of association in Belarus is a crucial point. It is another evidence of the high human rights standards in the Council of Europe. If the Belarusian authorities are thinking about restoring and improving Belarus’ status in the CE, they have to fundamentally reform the situation regarding the registration of NGOs, since the situation in this field is far from being perfect. Any other CIS country, e.g. Armenia, has 10 times more registered NGOs per capita than Belarus. I think that these figures speak for themselves,’ said Mr.Bialiatski. Benita Ferrero-Waldner, European Commissioner for External Relations and European Neighbourhood Policy, started her visit to Minsk with a meeting with representatives of the opposition and the civil society. On 9 May in Navapolatsk several skinheads attacked girls, activists of the local branch of the BNF Youth (youth organization of the Belarusian Popular Front party). In the evening two students were on their way home from the university though a forest-park. The unknown stopped them at a far corner, took away their badges with national symbols, threatening with bodily harm. The girls immediately called up police, but they didn’t arrive. On 5 May at about 10.40 a.m. the head of the entrepreneurs’ organization Perspective Anatol Shumchanka and his deputies Viktar Chaikouski and Volha Krumina were detained by the police in Kasmanautau Strip while getting out of the car. 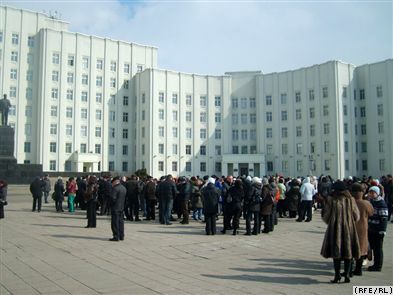 According to BelaPAN news agency, the National Assembly of Belarus has turned down the appeal by some 1,000 citizens urging the Parliament to form a public commission for revision of criminal and civil cases. Dutch Foreign Affairs Minister Maxime Verhagen expects that the Belarusian dictator won’t come to the EU summit to Prague on May 7.